Successful lake management requires an understanding of composition, depth and volume of your lake. Greg Grimes, President of Aquatic Environmental Services, Inc (Ball Ground, Georgia), had a client request an updated lake map to note current depths and mark sediment depths. 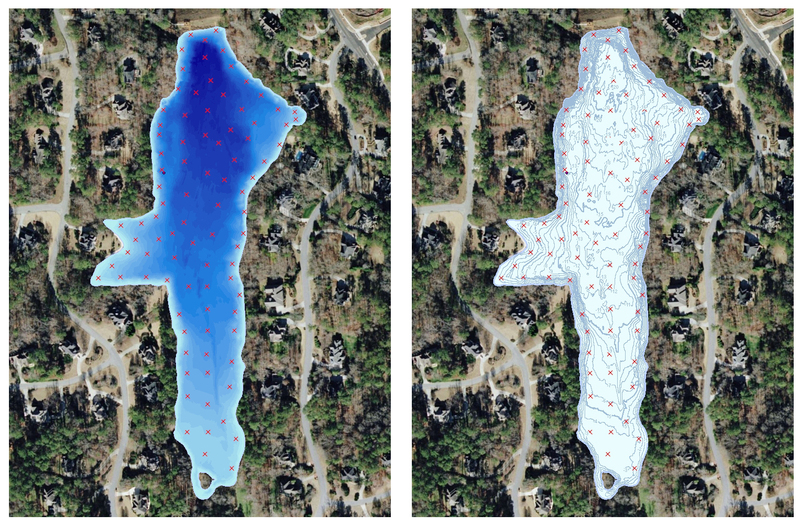 Information gathered during the lake mapping process helped Mr. Grimes’ client better comprehend the level of sedimentation building up over time in this fishing lake. The resulting map provided the baseline depth profile needed for long-term sedimentation monitoring. Plus, the property owners had several large format wall maps printed to show friends and family where to catch the big ones! This entry was posted in Lake Map, Sediment and tagged Bathymetric Map, Dredging, Fishing, GIS, GPS, GPS Lake, GPS Map, Habitat, Hunting Land, Hunting Property, lake, Lake Management, Lake Map, Lake Mapping, Lake Survey, Land For Sale, Land Mapping, Sediment, Sedimentation, The Mapping Network, Waterfowl on October 19, 2011 by Moderator.